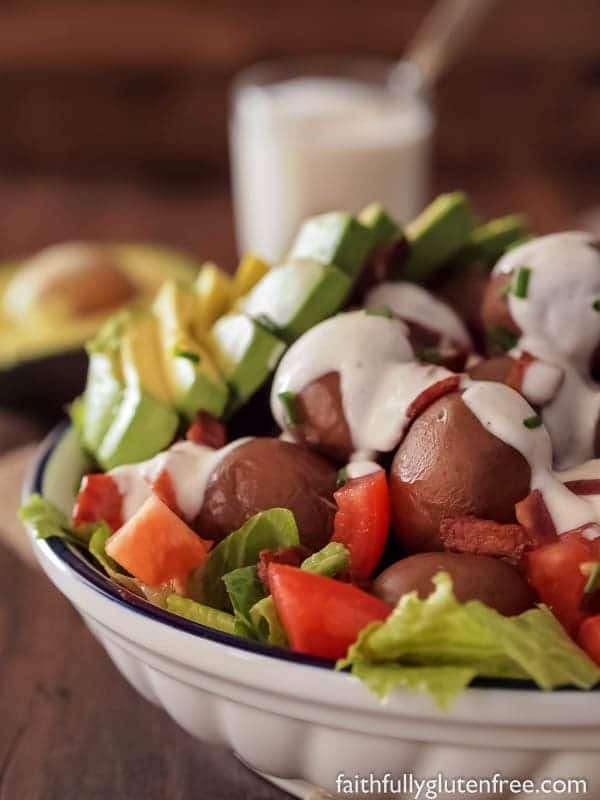 This Layered BLT Potato Salad, with a simple, creamy homemade dressing, is perfect for those nights when you don’t know what’s for dinner, or you just don’t feel like cooking. Quick and easy, it could be a meal in itself. We’re finally experiencing warmer weather here in Manitoba, we’ve actually had a few days where the temperatures were record breaking. I love this time of year, when my perennials start to peek through the ground, the leaves come out on the trees, and we can enjoy sitting out on the deck again. If you’ve been following me for any amount of time, you should know that sitting out on the deck is one of my favourite things to do in summer. I often take the laptop, a book, and a cup of coffee out there. Listen to all the different birds chirping, and the kids yelling at the park. It also means that we take more of our meals out the deck for dinner, because I think food just tastes better when eaten outside. It’s times like that when I appreciate quick meals, things that don’t require a lot of tending to inside, because I would rather be outside. That’s why I love this Layered BLT Potato Salad that I developed as part of my partnership with The Little Potato Company. Since the Creamer potatoes are small, with thin skin, they don’t require more than a quick rinse before cooking them, and no peeling! They cook up in only 15-20 minutes, and are quick to cool off for salad if you’re short on time. Although I call this a BLT Potato Salad, it is easily changed to a BLAT Potato Salad with the addition of avocado. I love avocado, but I know not everyone does. If you like it, and have a ripe avocado on hand, add it. If not, just leave it out. The dressing for this salad couldn’t be easier either. Mayonnaise, sour cream, and milk seasoned with salt and pepper. That’s it. Yet, it’s enough. My family really enjoyed this salad, even the kids. I garnished our salad with some of the fresh chives from the backyard, which was great, but not necessary if you don’t happen to have any on hand. You’re more than welcome to stir this salad together before serving, I just chose to layer it instead. If you are doing stirring it together, you will want to add the dressing right before serving, to keep the lettuce as fresh as possible. We enjoyed this salad with some grilled chicken, but I think it would be great with steak as well. 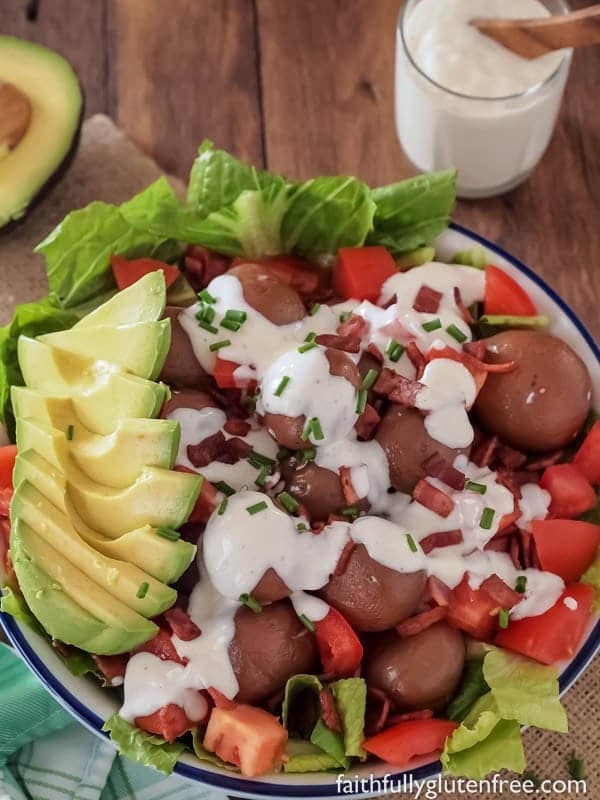 This layered BLT Potato Salad is quick to throw together, and great with the addition of avocado too! Boil the Blushing Belle Creamer potatoes according to package directions. Cook until they are easily pierced with a knife. Drain, and rinse the potatoes under cold water until they are cool. If you have time, you can refrigerate them at this point. In a wide, flat bowl, layer the lettuce, potatoes, tomato, bacon, and avocado (if using). Whisk together the mayonnaise, sour cream, milk, salt, and pepper. Pour the dressing over the salad just before serving. Here’s your chance to WIN a month of Little Potatoes. Open to Canada & the US, and you have until May 17th to enter! Good luck! Disclosure: This recipe was developed as part of my ongoing partnership with the Little Potato Company. All opinions expressed are completely my own. Hooray for warmer weather and more time to enjoy outdoors! This salad is a wonderful idea. I love the hot bacon salads with potatoes, so I know this will be amazing! Thanks, Megan! I hope you get a chance to try it! 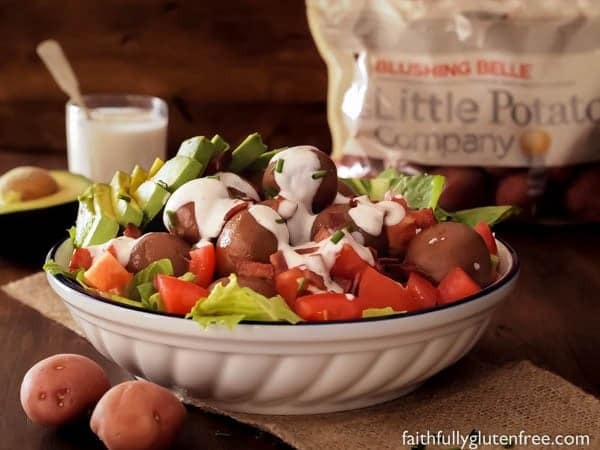 This looks so pretty and bet it tastes great!I love those little potatoes.Use them to make my pot salad now.No peeling yay!!! Less work/prep time is always a great thing. Hope you entered to win a month of Creamers, Karen! Good luck! This is a beautiful, simple side. I’m a blat girl too! Looks delish! My hubby is a huge potato salad fan, and you definitely can’t go wrong adding a BLT combo to the mix! Oh yum! This sounds absolutely delicious! You can’t go wrong adding BLT to potato salad. What a fun salad! I love these potatoes ,BTW. I love these potatoes! And what a gorgeous potato salad, Jeanine! It’s almost picnic season, so this recipe will be great to have. I’m going to make it meatless with sauteed oyster mushrooms though – AHmazing!!!! Thanks for another yummy recipe! These look great. I will trie make it!! !